I’ve already waxed poetic about my sweet tooth on here, so let’s just cut to the chase. Food is one of my favorite ways to show someone I care, period. Friends and family expect boxes of cookies or home-cooked meals to celebrate birthdays, milestones, and holidays. But now that these friends and loved ones are spread far and wide, my task has become a bit more difficult. As Valentine’s Day approaches, I think it’s time we take advantage of the good old-fashioned snail mail to send our love. While sweets are never really out of season, they do take center stage for an encore on one particular day in mid-February. As the saying goes, the way to someone’s heart is through his or her stomach—so I’ve compiled a list of simply delicious treats that act as blank canvases for the personal touches and creativity that make a good gifts unforgettable. 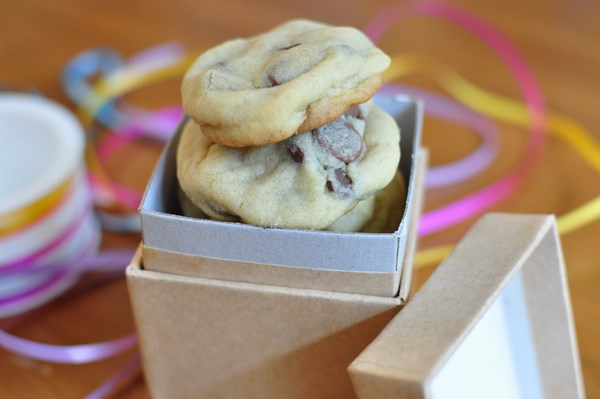 They’re also treats that send well, so find a shoebox to pack ‘em in and get baking! 2. Brownies. There is something about a good brownie that leaves me weak at the knees. (If you haven’t caught on already, I have a thing for chocolate.) And on the versatility spectrum, brownies score big points. Mocha brownies are only a spoonful of espresso powder away. Looking for a crunch? Toss in a handful of your favorite nuts. Spice up your batter with dashes of cayenne and cinnamon for Mexican-inspired decadence. Not a chocoholic like yours truly? Fear not. They invented the blondie for a reason. Equally as infinitely adaptable—especially with peanut butter and M&Ms. But brownies also rank high in the portability, as I find they are just as delicious a day later when the flavors have truly settled in. 3. Cookies. Everyone has a favorite cookie. Maybe it’s chocolate chip or peanut butter, lemon or coconut. Or perhaps just some simple, melt-in-your-mouth butter cookies gets your heart racing. Like their fudgy bar cousin, brownies, cookies are ridiculously versatile and portable. Swapping add-ins like nuts, candies and spices for the go-to chocolate chip is a no-brainer way to let your creativity reign free. Want to earn extra points with the gift’s recipient? Cut your cookies out into letters and write a special note. Sure, brittle sugar cookies may get a bit broken en route, but isn’t it the thought that counts? 4. Cake pops. Of all baked goods, cakes are the one of the most traditional modes of sweet celebration. We celebrate birthdays and weddings with cakes, so why not Valentine’s day? Because cakes, in all their splendor, can be cumbersome. They are definitely not snail-mail friendly either (just imagine opening up a box to find a smushed and smeared cake). Then along came the cake pop. Starbucks trending aside, these little goodies bring cake into the travelling gift realm. Not only do they travel well, but I think their bite size makes them all the more appealing! So transform your favorite cake recipe (box or from scratch) into a batch of cake balls for spin on the classics. 5. Flavored Syrups. If baking isn’t your calling, you can still send some sweet treats. Look no farther than its name to gauge how easy it is to make simple syrup. With a 1-to-1 ratio of water and sugar, you barely need a recipe. Freshen it up with fruits like tart cranberries, and citrusy lemons and limes. Turn up the heat with big hunks of ginger and a cinnamon stick; even make chai syrup! Diversify with fresh herbs like mint and rosemary. Mail out mason jars with mixing instructions (champagne, go-to liquors, mulled wine?). No matter the flavoring, it’s hard to resist these specialty syrups made for custom cocktails! And who wouldn’t want a cocktail created in their honor?! I enjoy your site. Thanks for taking the time. I will return back to read more and inform my people about your website.